Discover beautiful historic monuments and explore the mysterious mangroves of Nayarit on the amazing San Blas Jungle Tour. This tour departs from Puerto Vallarta and continues on to the Riviera Nayarit, where you’ll visit the "La Marinera" church and the legendary San Blas Fort, also known as "La Contaduria". Your guide will provide interesting historical details about these colonial buildings. Afterwards, you’ll take a boat tour of the La Tovara mangroves, where you can see various species of birds and learn about the local ecosystem. 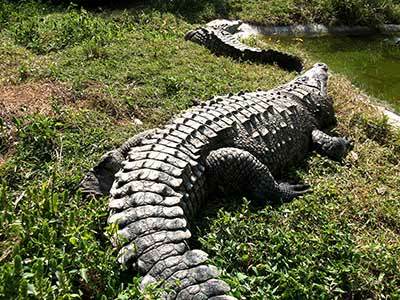 You’ll stop at a crocodile sanctuary, where your guide will tell you more about these reptiles. Then the tour continues to the La Tovara freshwater spring, where you can cool off with a dip in the refreshing waters. Before wrapping up, you’ll travel to Mantanchen Bay to enjoy some delicious regional cuisine and visit a traditional bakery to see how the tasty banana bread is made.